It was well after midnight as our plane, named for the sacred bird-god Garuda, took to the air to begin our long-anticipated trip to Bali. We watched the bright lights of Los Angeles disappear slowly behind us, and settled in for the long flight that would take us to the other side of the world, to this beautiful and mystical island, where other realities hold sway, and where life is governed by forces deeper and more mysterious than those we know in the west. We had flown down from San Jose earlier in the afternoon and met up with our friends Justine and Steve in LA. 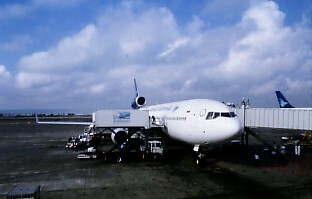 We were all excited to see Bali for the first time, having studied its culture and played its music for several years. Our flight stopped briefly in Honolulu, Hawaii after about 5 hours to refuel, and then headed out into the night across the Pacific. We awoke somewhere over the South Pacific, with atolls and tiny island chains far below us. 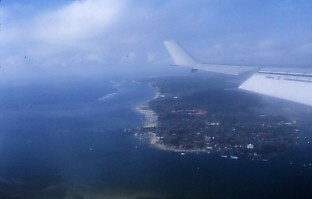 The hours wore on, and eventually we started to see the major islands of the Indonesian archipelago. 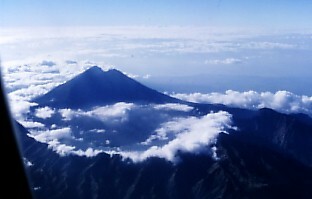 This volcano must have been on the island of Lombok, just east of Bali. Looking down we could see the strait that separates Lombok from Bali, and finally Bali itself - the island we had heard so much about for years, and which had haunted our dreams and imagination and inspired our music. We flew over the green terraced rice-fields and tiny villages that looked almost medieval, the great volcano Gunung Agung towering in the distance. 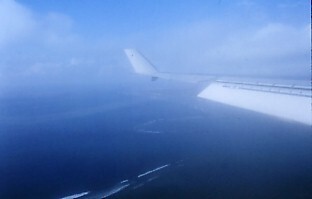 Finally, after a low approach over the ocean, with flotillas of rusty-looking boats, we touched down at the modern airport of Denpasar. This was a final look back at the plane that had brought us so far. The airport at Denpasar was just the first glimpse of the incredible art scene that is Bali. 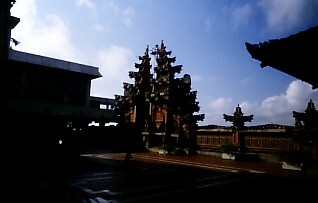 Even the airport had a ceremonial welcoming gate built in the form of the traditional split gates of Balinese temples. We had built a split gate like this back home in California for out performances - ours was made of plywood and paint, this was the real thing.